Made for comfort and style, this ottoman provides the perfect space for anyone to lay their legs on. Perfect for any home with a contemporary, sophisticated feeling, or classical, casual feeling. Made with soft cushioning, it is comfortable and with the ability for you to chose the fabric color, it can be personalized for any home. 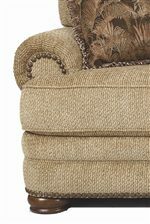 The Stanton Nailhead Trim Ottoman by Lane at AHFA in the area. Product availability may vary. Contact us for the most current availability on this product. Seat Plush cushion provides fantastic comfort. Leg or Skirt Carved wooden legs. Wood & Finish Wood is finished to match selected fabric/leather and looks beautiful with any room.